After a 2008 and 2009 season that exceeded all my expectations I made a random decision (5 weeks out) to ride 12 hours solo at the Moonride in Rotorua. About 4 years ago I made my first attempt at this a week after running Rotorua Marathon and having only ridden a mountain bike about 5 times. I can say it didn't motivate me to go back! Lisa gave me a 3 week intensive programme that I kind of managed to follow and all to soon the it was Tuesday and I was packing up getting ready to go. After two days in Auckland for work and getting a slight cold I arrived to a wet Rotorua. Shane assured me my Speed Kings would be fine and they were. The course was shorter than I expected and slightly easier. The first two laps were a mass of traffic jams with people sliding all over the place and people walking up slight pinches. I managed to not put my foot down and did a fair bit of balancing. It was hard not to just hammer it past the slower people and it took discipline to control my speed. By lap 3 I had caught up to Katrin, the only other 12 hour solo female. I sat behind her for a while and then passed her on the 4wd track. This is when I got a little "excited" and wanted to hammer it! Some helpful advice from Shane soon calmed me down and I moderated my pace accordingly. Katrin passed me on lap 4 and I kept my pace steady and just sat behind her - this is when I lost count of laps. Four laps became 5 which some how turned into 23 – it was all kind of a blur. Clive passed me many times and looked very very strong – future force in endurance events I think. It was great to have the support of all the Bushlove riders as I rode past their tent site and as they passed me in the forest. Also thanks to Chris and Derek at the police tent for their support. At some stage I ended up ahead of Katrin and kept the lead until the end. By about 3pm I had exceeded my expectations and was feeling strong. I started to struggle when it got dark and this is when peoples behaviour overtaking became crazy! I got totally taken out by a rider overtaking where there wasn’t in space. I went flying over the handlebars and landed on my head. This made me quite angry and to be fair to the guy, he was very apologetic. It was great to hear Jude’s friendly voice come up behind me in the dark giving me encouragement. By this stage I was counting down the laps and it was a relief when we calculated if I did 2 more laps Katrin couldn’t catch me. I ate really well and can recommend Watties tinned spaghetti, lollie cake, leppin, perpetuum, moro bars and dried fruit as great endurance food. My last lap was great thanks to a flat bottle of coke! To complete this kind of event you need superior support. I would like to thank my Mother who was a real trooper, always there and trying really hard to anticipate what I needed. I certainly couldn’t have done it with you! Shane and Jude were amazing especially with general encouragement and sharing your wealth of knowledge and experience with me, it certainly made my day a whole easier and more fun! 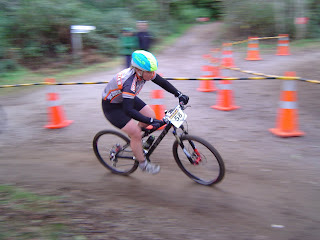 Thanks to Chris at www.purepsorts.co.nz for forks and brakes and to Bruce at VIC cycles – the shirt rocked!